Those quirky, kinda creepy, and oh so much fun, Monster High dolls are getting more and more popular by the day, and that’s not just at their “school!” Created with a sense of humor and definitely targeted towards older tweens, the Monster High characters are named after famous “monsters” in history like Dracula – whose daughter is Draculaura ; Mr. Hyde who has a son named Holt Hyde; and a sea monster who has a fashionable daughter named Lagoona Blue. Honestly, when it comes to Monster High you either love them or find them completely inappropriate, although they are starting to grow on me a bit! My daughter asked me to make her a word scramble of all the Monster High Characters – which would be a perfect game for a Monster High Birthday Party . Click on the image to view and print full size or scroll down for the PDF version of the file. Or download the Monster High Word Scramble as a PDF file. Looking for the answers? 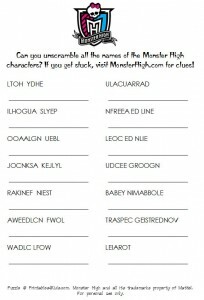 Check MonsterHigh.com for clues. Monster High is definitely one of the most popular birthday party themes for tweens right now and Monster High Costumes are going to be in demand this Halloween, too. Here are just a few of the Monster High party supplies and costumes we have found so far.